This will be a great one for my school project!!! Thanks Shawn,i nearly named it "Kaleidoscope eyes" but i thought naa,sounds like something out of a well known Beatles song.....Look for the girl with the sun in her eyes and she,s gone. You mean besides "Really cool"? I like Jack's thought about the points. But it looked like a kaleidoscope of your building to me. I bet your current title is going to get you a lot of views / and answers to the title! I like colors and the lines, thanks for sharing. 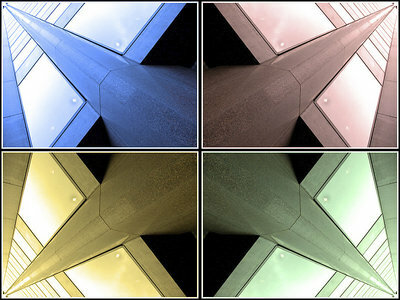 I'd call it 4 different versions of 1 point persective of an exterior high rise building. Well done. Hi David, Very creative presentation. I'd call this whatchamacallit a futuristic version of Christmas Decorations....:) Refreshing! I call this abstract, and a very nice one: colorful and beautiful. congrats.